Not all geomembrane materials can be left exposed because of the effect of either UV radiation or changes in temperature. The latter causes thermal expansion-contraction swings in highly crystalline products such as most polyethylenes, particularly HDPE. For those products, long life exposure is not an option because the life will be greatly reduced, even if a lighter color is substituted. Utilizing a geomembrane with a proven, long-term UV life, and negligible thermal-expansion contraction. Covering selected areas where foot traffic or other disturbances are expected during the project life. 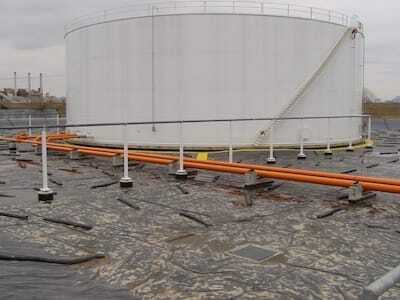 Exposed membranes have been covered by other membrane products (walkmats) in the roofing industry for many years. Providing a porous media (geonet, geotextile) under the geomembrane and providing a positive slope to the dikes from the center. This is a particularly good practice in a geomembrane-lined liquid impoundment for passive venting of the subgrade. Take a look at the project and consider the facility operation. Innovative design allows exposed membranes to offer many features also inherent in a covered application.